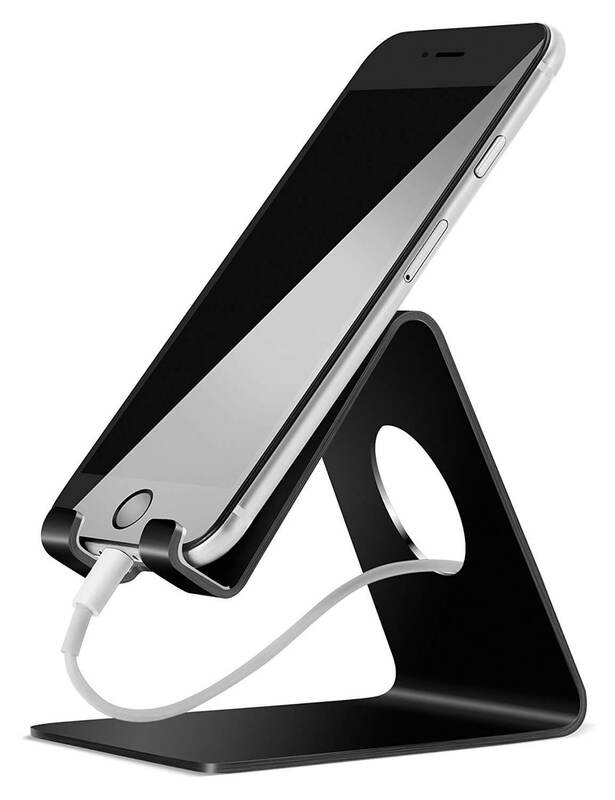 Today’s Deal is on a great accessory for those who don’t like having your phone laying on your desk or nightstand. The Lamicall S1 Phone Stand is made of aluminum, has cushioning to protect your phone and comes in four different colors for $9.99 today on Amazon. The stand is designed to hold any Android device or iPhone as the padded cradle is 15mm in depth. This means it will fit a Google Pixel, Samsung Galaxy S6, S7 or S8 and an iPhone. In fact, most of these devices will fit on the cradle in their cases. The Lamicall stand is designed to give you a great viewing angle for your video calls or for watching streaming content. It is also compact. It stands only 3.35″ tall and has a base of 2.95″ x 3.94″ so it won’t take up a lot of space on your desk. The bottom of the stand has four anti-skid pads on it to keep it from moving around and from scratching up your desk. where you can feed through a USB or Lightening cable easily. Plus, because of the angle that Lamicall has built this stand, it won’t pinch or crimp the cable while it is charging your device. The Lamicall S1 Phone Stand comes with a one year warranty and a 30-day return policy so you can try it out and see if it works for you. It comes in Black, Red, Aluminum (Silver) and Space Grey. All of the colors are the same $9.99 price and, of course, for Prime customers shipping is free. For more details and to order yours, head over to Amazon.